The latest Black Diamond Credo Shorts are built from durable and stretch organic cotton twill designed let you move freely and comfortably no matter how hard or intense the climb. Made from stretch organic cotton twill (98% cotton, 2% elastane), the Black Diamond Credo Shorts have the breathability, and soft and fresh feel of cotton with just enough stretch in the right places to enhance mobility on technical manoeuvres, shorts-style for summer climbs. The main advantages of organic cotton in climbing pants is its ability to stay fresher for longer, inhibiting the growth of bacteria as well as resisting smells clinging to it, meaning you can go longer in between washes in pants that still feel fresh after repeated warm climbing sessions. 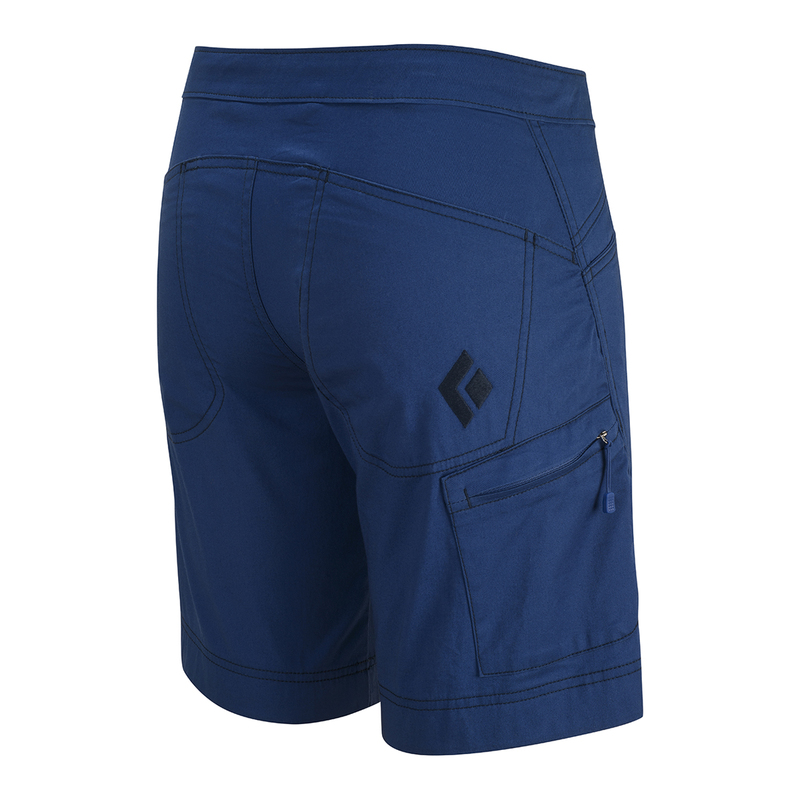 The Credo Shorts also have reinforced knees to protect against rips and tears on rocks and provide durability on awkward knee bars and top outs. The leg openings are adjustable for a customised fit and heat management, and they also have a rear brush pocket, so your brush can always be less than a stone's throw away whenever you need it. 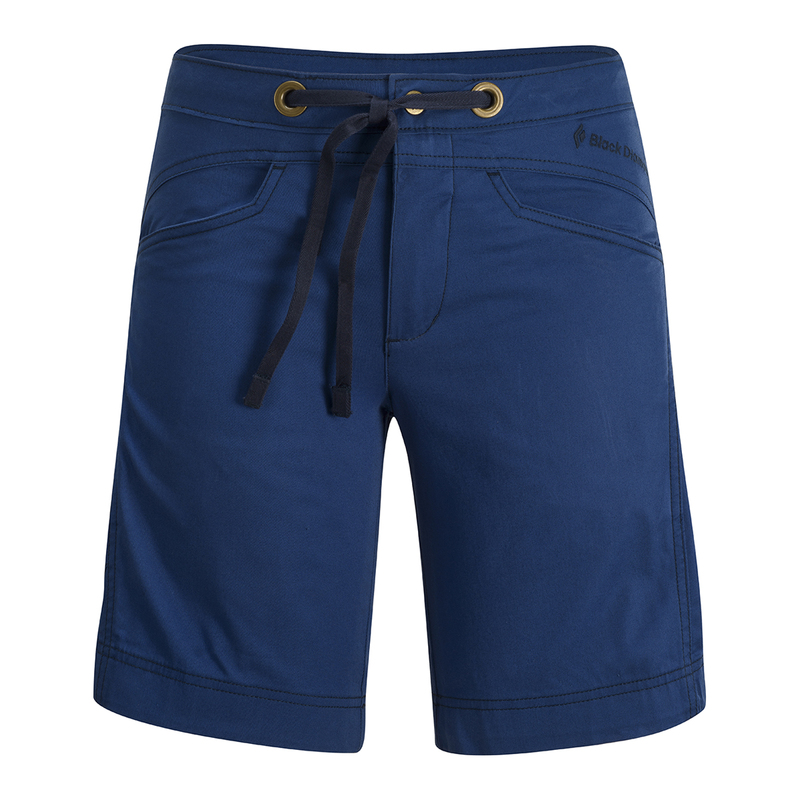 Regularly worn for multiple sessions with extended periods of time between washes, climbing shorts need to stay fresh and comfortable. The newest Black Diamond Credo Shorts introduce an updated design and organic cotton to be kinder to skin and stay fresher for longer, as well as more environmentally-friendly and sustainable, prolonging the life of the world we climb in. Durable, breathable, comfortable and non-clinging, and naturally bacteria and odour-inhibiting, organic cotton has tough fibers that are able to stand up to repeated washes, allows the skin to breathe, is soft to the touch, resists smells clinging to it, and prevents the growth of bacteria. This means that organic cotton can go longer in between washes and maintains a highly comfortable feel, making it the ideal fabric for outdoor sports. Aside from that, it is much more sustainable than standard cotton, using non-GMO (genetically-modified) seeds and no harsh pesticides or insecticides, making it kinder to skin and much more environmentally-friendly, as well as supporting fair working conditions. 2% elastane content to add stretch and freedom of movement.